NASA will spend $1.271 billion on planetary exploration this year, significantly less than what Congress appropriated but $75 million more than initially proposed. This number is from the final version of NASA's operating plan, the agency's internal implementation of the budget given to it by Congress. The across-the-board cuts known as the sequester drove NASA to propose spending a mere $1.196B on Planetary Science this year, essentially ignoring the fact that Congress had stepped in to provide additional funding for the program. Fortunately, Congress rejected NASA's first operating plan (partly in thanks to the one thousand messages sent by supporters of the Planetary Society). The final number is still less than an even application of the sequester cut, but it's far better than the alternative. The budget for NASA's Planetary Science Division faces real uncertainty. Notice the large discrepancy between the President's budget requests and the actual budgets passed by Congress. 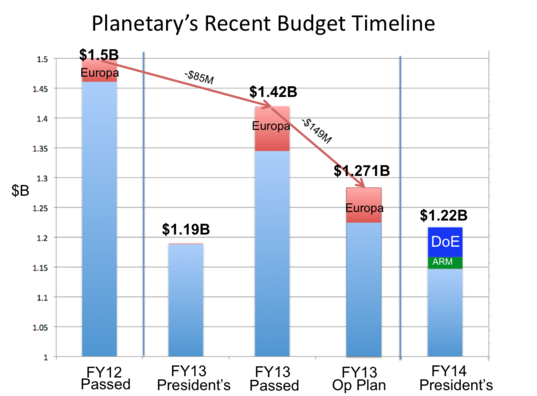 The 2013 operating plan is the final number for Planetary Science this year and includes the sequester cut as well as additional reductions imposed internally by NASA. The Europa spending in 2013 is an estimate. This brings to a close the long, frustrating saga of the 2013 budget. My blogging colleague here at the Society, Van Kane, has good analysis of the consequences of this budget uncertainty, both imediate and long-term. 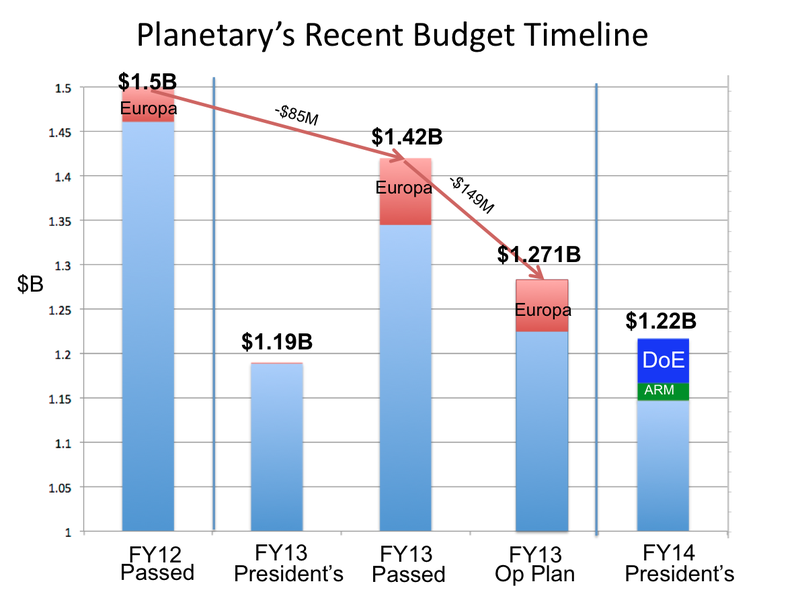 Even though NASA relented a bit and provided $75 million more than originally proposed, the Planetary Science Division still sees a cut of $229 million from last year. Fortunately, we have strong advocates in Congress, and though the White House again requested sharp cuts to the program for 2014, we're working towards reversing those as well. Overall this is good-but-not-great news. We now know that the highest levels of NASA do not particularly value planetary exploration. 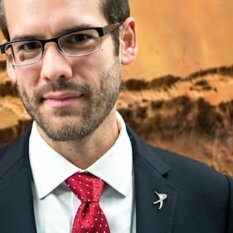 Congress does have relatively strong support, but larger partisan issues have overturned the normal flow of the budgeting process, resulting in extended periods without Congressional guidance, leaving internal budgets under the direction of White House and NASA policy, which does not help us. We hope that NASA and the White House gets the hint about providing additional resources to the popular and productive planetary program. We'll keep following this closely, but from now on we're looking to the future. At least it is a step in the correct direction. Lets hope here is not a backslide to this. Casey, I don't suppose there's any chance you could get one of the 'highest levels of NASA' to guest blog here. I assume they have their reasoning, and it would be of interest to hear it. Why, exactly, is $100M off planetary science more palatable than $100M off heliophysics or manned exploration for them? Of course, if they just give boilerplate text about 'hard choices', that's not worth having: what, precisely were the choices, and what did they see as being at stake? David: That's a nice idea. I'll reach out and see if there's anyone in HQ willing to write about that topic. "Lies, damned lies and statistics." FWIW, it is considered a conceptual trick to cut off statistical bin graphs, since it bloviates trends. Else, good work!